Fresh Mart is a chain, who's hallmark is, as the name says, fresh foods. They have the most incredible produce section. All the usual suspects, plus things you normally just don't see in supermarkets---at least not around here. Baby zukes and pattypans, for instance (the pattypans about the size of a nickle). And French filet beans (which is what I used for the gingered beans the other night). Etc. They do all their own butchering. So if you don't see a cut you want in the display case, you just ask, and they go back and cut it for you. Most of their fish is fresh, as well, or clearly identified as previously frozen if that's the case. Also in the seafood case, and which I don't see in other markets, oysters, clams, mussels in the shell; shrimp in sizes otherwise not seen (i.e., U-10s). We love the place. It's a 35 mile trip, each way, but worth the drive to get fresh foods. They do have some organics. But presumably they're the same organics as any other market is selling---which means they come from the organic division of a factory farm, rather than from the small, diverse, true organic grower. Alas. Oddly enough, and despite what I first thought, it doesn't take a second mortgage to shop there. The first time we did we dropped a hundred bucks. Trying to recreate that shopping list, as best I could, at Kroger would have cost about $94. Not a bad premium, considereing the incredible difference in quality. What we do is make a weekly trip to Lexington, shopping. Stops include Fresh Mart; the Good Foods Co-Op; Wild Oats; and a selection of ethinic markets, depending on what I plan to make the following week. With a round-robin like that, the cost of gas gets lost in the shuffle. A have friends who've worked in various Perdue processing plants. I'll skip, thank you very much. BTW, just because something is natural doesn't mean it's good for you---aesthetically or nutritionally. Cow flops are natural, but I don't want them on my dinner plate. And there is nothing more natural than heroin. It is always interesting for me to read your posts I learn so much. What exactly is a pattypan? Pattypan or scallop squashes are soft-skinned (i.e., summer) squashes. Basically round and flatish, they have scalloped edges. There are many varieties of them, in a world of colors. I had been browsing around some of the cooking blogs on the web last week and came across a cooking blog in the Philippines that had a recent post about the barbecue stands on the streets of the towns there. 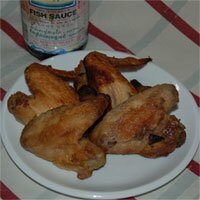 I've been to the Philippines a number of times and those barbecue stands inspired this recipe in our blog which I named Savory Oriental Chicken Wings. My adaptation is a little more westernized then some of the meats used on the bbq stands in the PI. The Oriental chicken wing recipe is easily adaptable to boneless skinless chicken pieces placed on skewers and cooked for a few minutes over hot coals like the stands in the Philippines do. Keep the bamboo skewers from burning by soaking them for 20 minutes (while the chicken is marinating) before threading the pieces of chicken on them. My preference is for using boneless skinless chicken thighs when making them this way as thighs have more flavor.